At the final exhibition of the Urban Typhoon Workshop in Khirkee, my team organized a public projection of a video we made about the unpaved road where Khoj Studio, an artists’ cooperative and one of the conference organizers, is located. During the screening, it was crowded along the street, and I was lucky enough to stand next to Mamta, who runs an ironing shop on this street in Khirkee. I watched her shyly giggle when she saw herself projected larger than life onto the building wall. Another audience member saw her in the crowd and recognized her from the video. He yelled to her over the noise, “When are you making your Bollywood debut! ?” She looked up proudly and grinned. 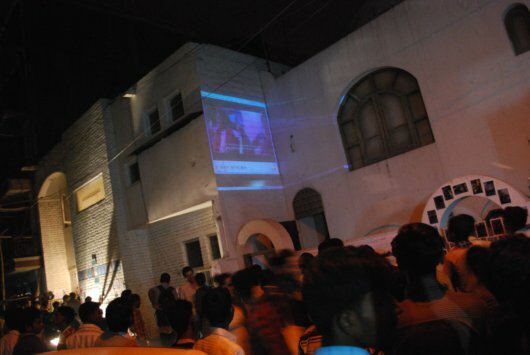 This media piece was projected outside the Khoj Studio building during the final exhibition day at Urban Typhoon. The public screening of the video along the unpaved road in Khirkee Extension. In my previous post, I explained that our team’s project was to create a guidebook for this nameless, unpaved road, which serves as the main commercial corridor in Khirkee Extension. While exploring the street, we learned that it is not actually nameless, but rather a thruway with many names because how it is referred to changes depending on whom you ask. The unpaved road is always bustling with activity and provides many residents of the area with the space to pursue their livelihoods. However, because of the unauthorized nature of the space, the road remains unpaved and floods several times a year. Also, the street is not shown on any official city maps. In the beginning, I was nervous that the methodology we undertook to complete our project went against my own values in the field and much of what I learned in planning school. Who did we think we were to create a book about a street that we only engaged with for one week? What did we really know and what could we actually find out in just one week? As we made new friends along the thruway explaining to everyone that we were interested in better understanding their street, we obtained permission to videotape our conversations and photograph the people and building facades. We used this research to inform our book, but also created a media piece that brought together the many voices of the road. I realized that the book gave our team a personal space to document our process and capture our own experience along the unpaved road. We were not trying to solve a specific problem, influence a finite decision, or depict how things should be in Khirkee. We were simply recording what we saw and what others might also be interested in seeing and knowing about this road in Khirkee Extension. Outside the studio another team assembled a community portrait installation. At the final exhibition of the workshop, which profiled every team’s project, we planned to present our guidebook. 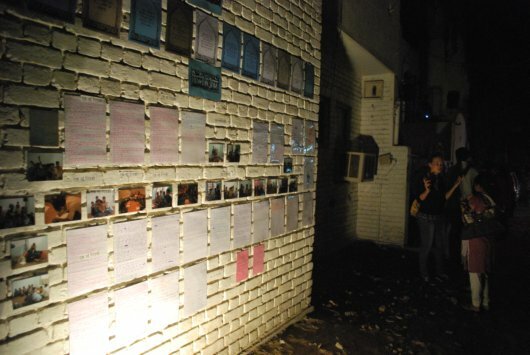 In order to prepare residents and locals for the exhibition, we distributed blank postcards with an illustrated map of the street, which we developed from our photos. We asked the street’s business owners, workers, and residents to identify their establishment on the streetscape, and told them to add any other relevant information about their business or home or favorite place to the map. We explained that these postcards could even serve as adaptable business cards for those who wanted to use them that way. 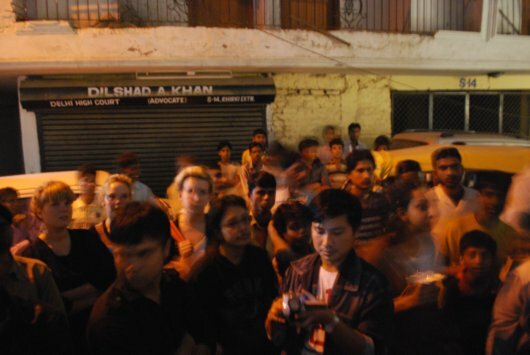 And then we invited everyone to the exhibition and our video screening, which was taking place on the street itself, outside Khoj Studio. 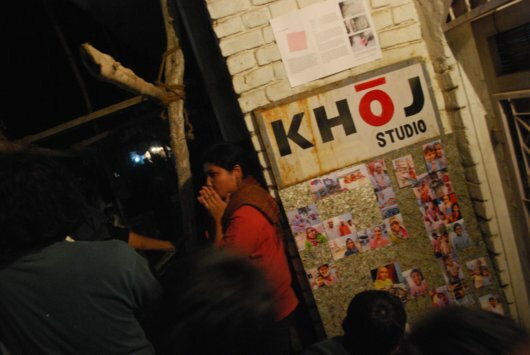 A photography and storytelling exhibit outside of Khoj on the final exhibition day. It was all very exciting, but also very chaotic. We made the screening time for the media piece 6:00 PM to make sure it was dim enough outside to see the projection. However, because it was so dark, I couldn’t really keep track of who was in the crowd. I did see some familiar faces like Mamta’s, but in the end, I wasn’t really sure who all attended. For me, the video screening was a way to thank all the people who spent time talking with us. I wanted to make these individuals stars of their community by broadcasting their thoughts to everyone, even if it was for only a few minutes. The audience watching our projected video. Photo by Aditi Mehta. This whole project and experience made me think more about the “outsider-insider complex” as a planner. What makes a planner a good outsider? Also, how do insiders know when to invite outsiders to help them solve their community’s problems or involve them in neighborhood civic life? Maybe our guide and video projection – created by outsiders – will spur meaningful dialogue among insiders about the changing identity of Khirkee. During the Urban Typhoon Workshop in Khirkee Village, I formed a team with Alisha Mody, Anette Flygansvaer, and Gislunn Halfdanardottir. Alisha is a former management consultant previously based in the UK. She left the corporate world and is now focused on finding a socially entrepreneurial way to inform travelers about innovative initiatives in emerging markets. Anette and Gislunn are both from Norway and work at the architecture firm Fantastic Norway, which is a studio engaged with building and site design, development strategies, and mobilization processes. Project Team: Gislunn, Anette, Aditi, and Alisha with video projection behind them. Please visit URBZ, Khoj, and Knowledge Live to learn more about Urban Typhoon. Aditi Mehta received her Masters in City Planning from MIT in June 2010. This is the second Urban Typhoon workshop she attended. The first one she went to was in Koliwada in Dharavi, Mumbai. Her other series on CoLab Radio include Who’s on Broad and The Library and Society. I love this movie because the people so obviously love their place. Almost everywhere I’ve been, people will love their place and want to fix the problems they see rather than find a new place. The insider / outsider dilemma you are describing is a constant issue for me, and for most urban planners. I really believe that local people know their neighborhoods better than anyone else and should decide the future. So where does a planner fit in? How can she inject ideas without exerting power? Some places have been so traumatized by outsider interventions that they now reject outsider ideas to such an extent that it is to their own detriment. Conversely, I see some planners who are so timid of their outsider status that they’re afraid to even come in to a community. This workshop is interesting because you do descend upon a neighborhood, but with no intent to exert your will (in design, policy, or any other arena). I wonder what impact your presence made, or if Khirkee got more or less out of it than the participants themselves. Beautiful, Aditi! I love it!! Alexa – you very poignantly summarize the dilemma of a planner. “How do we inject ideas without exerting power?” In some ways, the workshop is a good format for people to give ideas and share perspectives without imposing anything because it is short-term and no one who attended really expected to solve anything or come up with concrete solution for any issue. And so, people came, used their background and experiences to brainstorm, and produced something that was inspired by the place. But, my question now is do the locals want to actually maintain the momentum created by the workshop, and if so how? The fact you chose to use to project a film was a novel solution to the insider/outsider dilemma you’ve described. 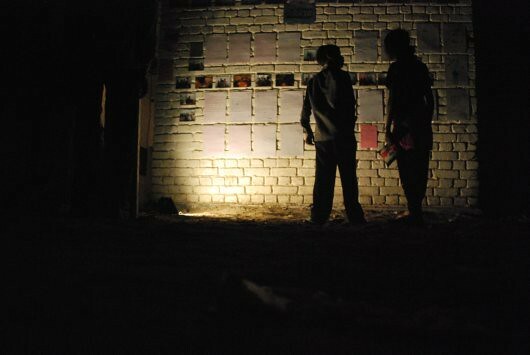 The film, besides being a great piece of public art, was a powerful, transient, and non-obtrusive way to spur dialogue. You allowed this community to feel their own presence in a new and empowering way. I know I’m repeating what’s already been said but I love everything about this project.